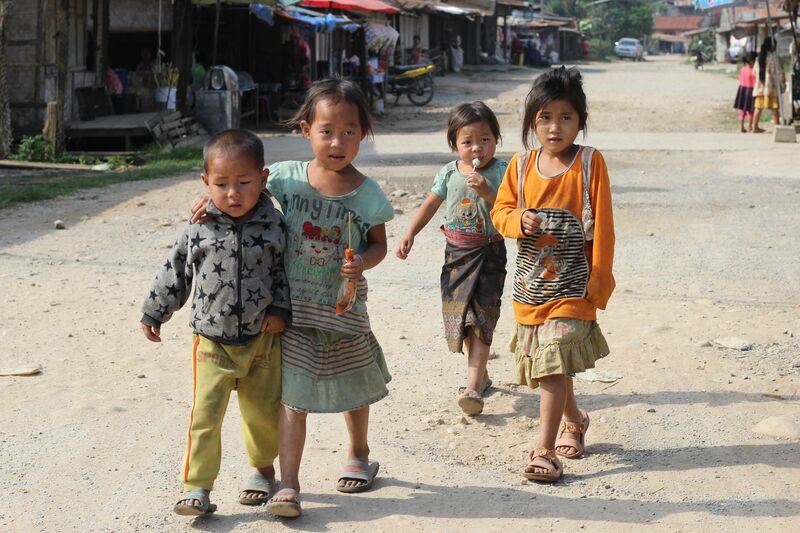 A search on our our GPS for the village of Long Chen in Laos brought up nothing. This is not unusual in SE Asia as many of the names are anglicised, an S can actually be an X, a T can be Ch and in this case, Long Tien is another possible spelling. Punching in other possible spellings of the name Long Chen, Long Tien… still no results. 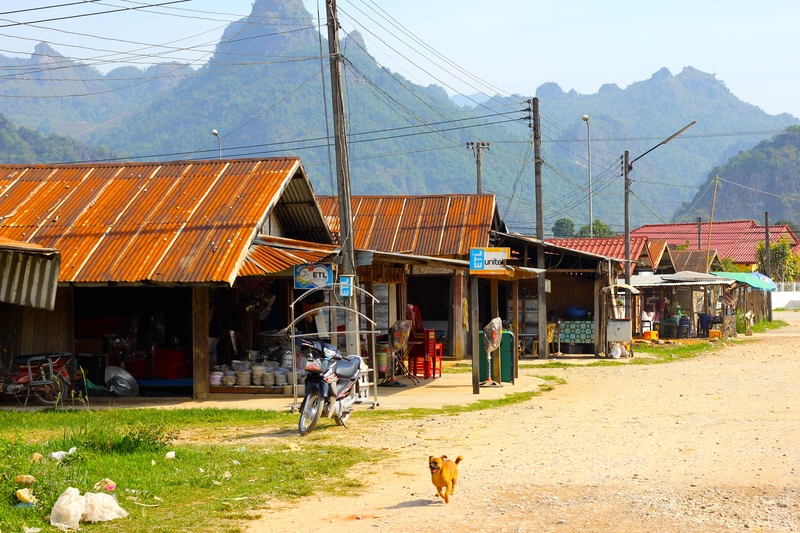 With our usual mix of a little bit of knowledge, a lot of ignorance, sketchy online trip reports and Australian political naivety we took off from colonial Vientiane, the capital of Laos, into the remote mountains. 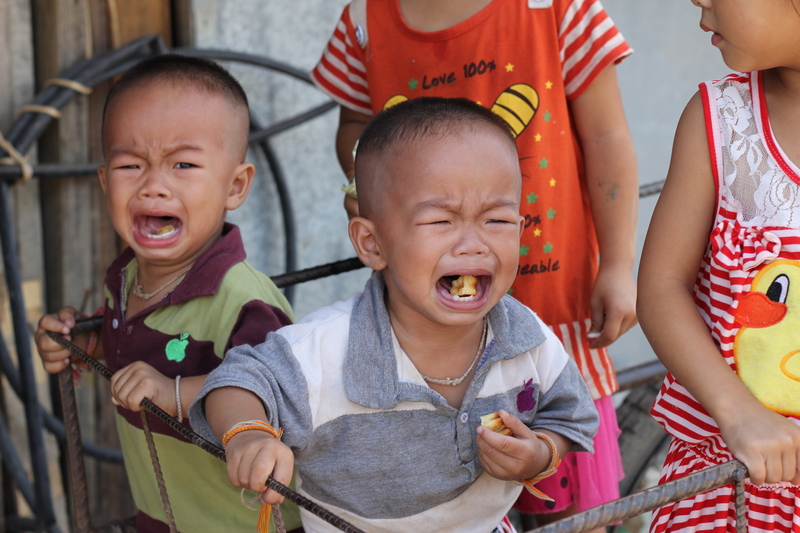 We knew the village of Long Tien still existed as other people had recently blogged of their attempts to visit it, some successfully and others not so successfully. 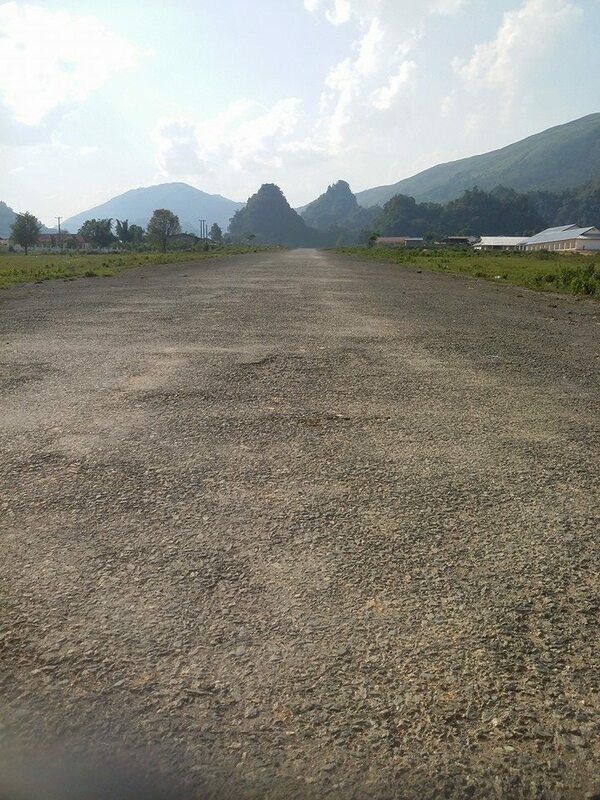 Finally zooming into our offline map of the province Vieng Khoun, the infamous airstrip appeared; the Long Tien airstrip! Our destination it appeared, was in one of the many restricted areas of Laos. Entering them without permission can lead to “house arrest.” But, we did not know that, until later. These sensitive areas are historically heavily guarded by military, and appear on maps as small yellow boxes entitled, “Entry may not be granted.” However, with a mix of luck and the right attitude, we believed we could gain access to Long Tien. Being turned away would mean retracing the ride and possibly a very late finish on a rough dirt road, much akin to an Aussie 4WD track. Not the result we desired. 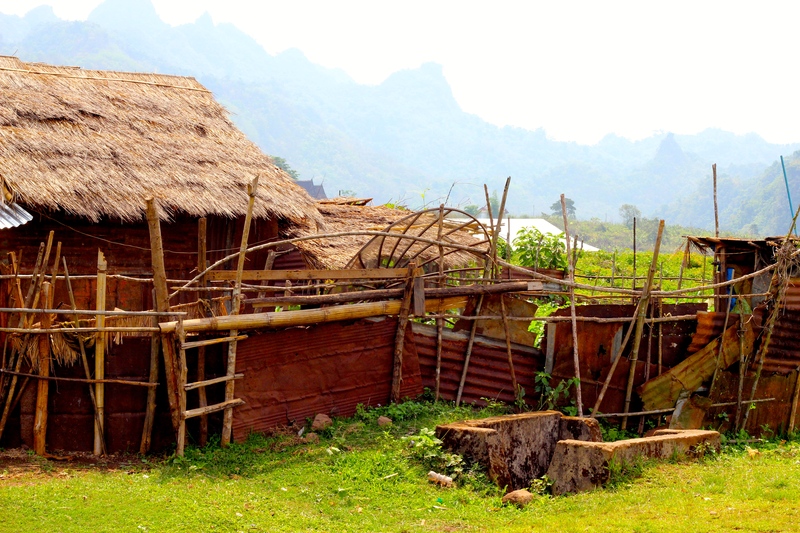 Long Tien was of interest to us because it was for over 15 years, the site of a secret CIA base hidden deep in the remote and rugged mountains of Laos. It was so secret even the Congressmen of the time knew nothing of its existence, not to mention the people of USA. The pilots who volunteered to be part of operations at Long Tien, who were named The Ravens, did not wear uniforms nor did they carry official airforce identification. Their ID cards simply had their names and cited them as employees of the USA government. Long Tien was once a city of 30,000 people. Most of them were Hmong people resisting the advancement of communists within their country and were actively recruited by the CIA and on their payroll. 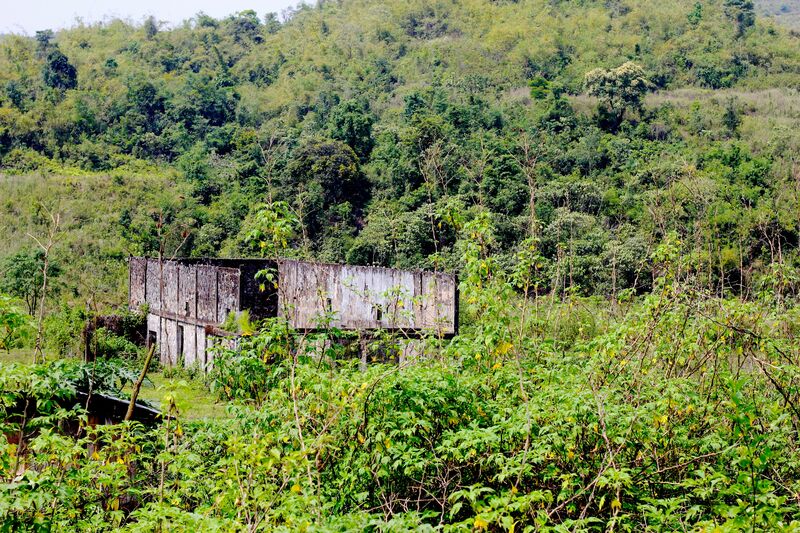 Whilst the Vietnam-American war was taking place, there was also this secret war taking place in Laos. At the height of the Vietnam war there were reported to be 1 million US personnel in Laos. (The population of Laos is today only 5 million). America’s actions defied the signed Geneva Convention which declared Laos neutral and also which declared bombing of civilians to be a war crime. Hence the need to deny their involvement in Laos at all. Laos was not at war, or so the Americans said. 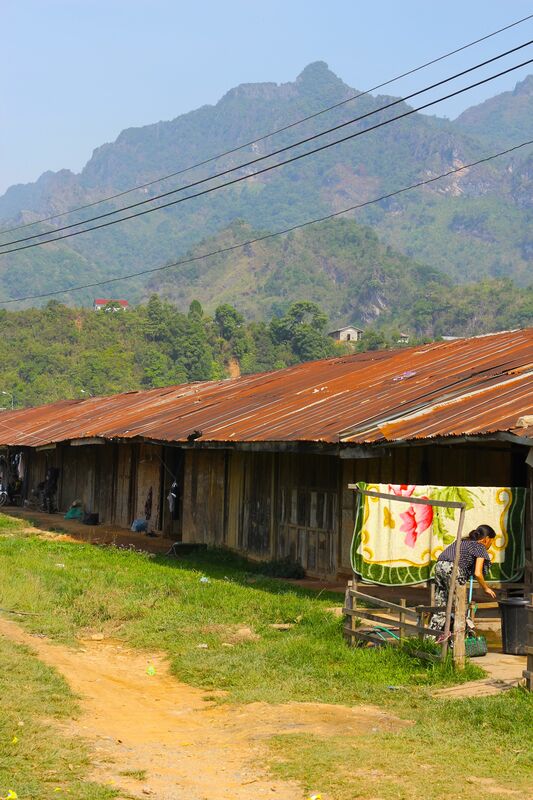 Our ride into Long Tien promised to be exciting as it seemed that forty years after the CIA and the Laotian General were secretly airlifted out in 1975, the Laotian Government is only just beginning to loosen restricted access to the area. Forty years later! 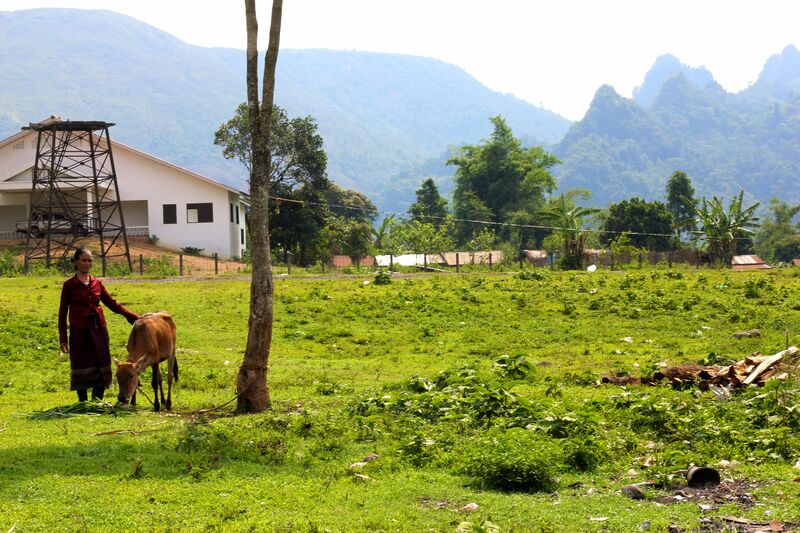 It was also reported to be hidden in some the most beautiful landscapes of Laos. This trip soon became a very moving and sobering experience. 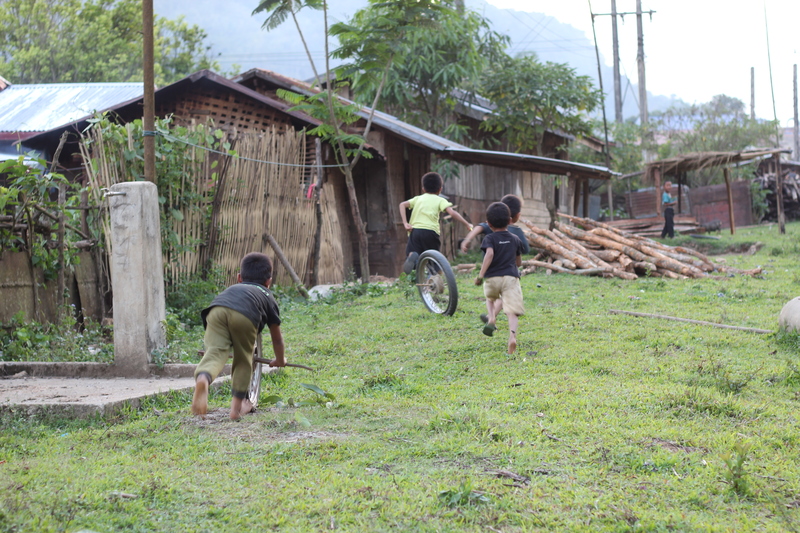 Our first night on the loop was spent in a village called Xaysombourne and was our initiation into Laotian hospitality. We had arrived on the evening of the public holiday of Labour Day and were quickly enfolded into the celebrations local style. We were greeted by many people with the hello of “Sabaidee” The friendliness of the people reminded us of our time in Indonesia, but this time were weren’t in a Muslim country! 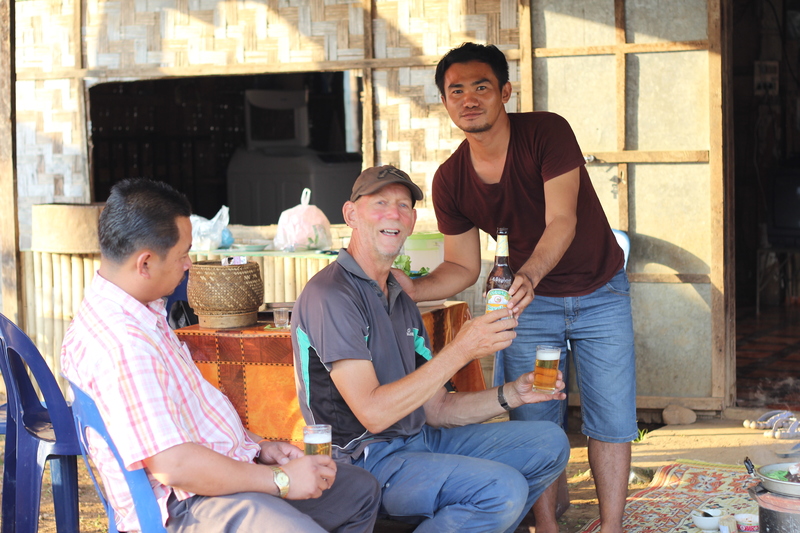 Being invited in for a beer seemed to be the local way of offering hospitality. Xaysambourne- access only recently relaxed. Very friendly people who tried to get us drunk! There was certainly the feeling that these people had seen very few westerners as children ran and hid as soon as we looked at them. Even babies stared at us and cried! This too was a restricted area until recently. All the children cried at the sight of me! The next morning we began our ride towards Long Tien. The road conditions were unknown, rain was looming and we weren’t sure what reception we would find at the end of the day. Reports from other travellers were conflicting, some of which were peppered with tales of military hostility and others of cautious regard. It seems that some visitors may be granted access to the village and others not so. Recent ride reports led us to believe security was more relaxed. As promised, the terrain was magnificent with amazing vistas of Limestone karst formations and tall mountains. 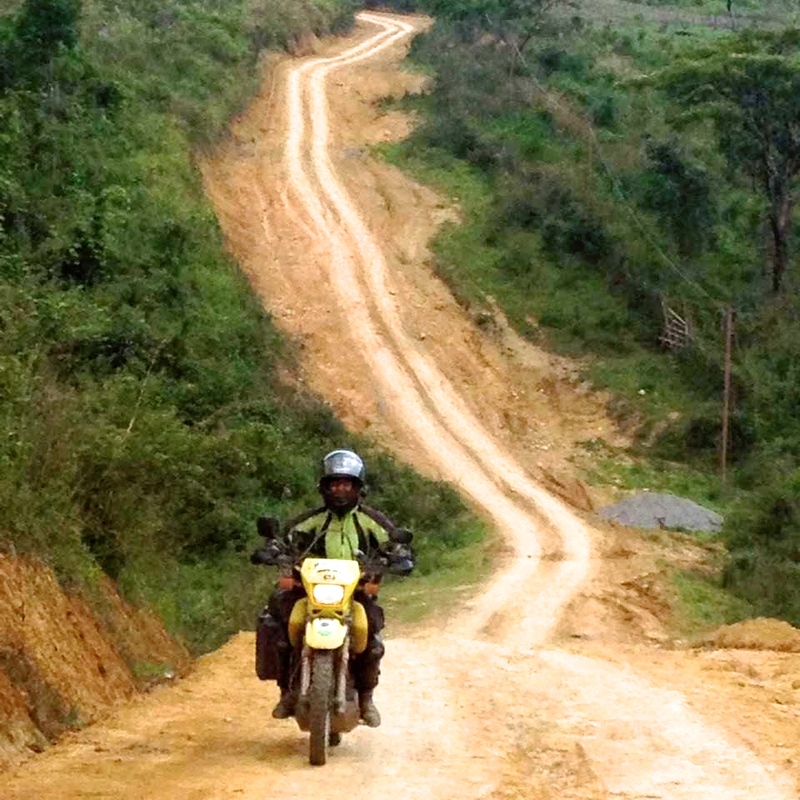 The road surface was rocky and the terrain steep as we climbed up to 1500m. The road was serpentine, but manageable until we reached a particularly challenging section of wash out ruts, hairpins and large rocks. Still riding on the same tires we had left Australia with, we were riding cautiously and with some trepidation. At one point, I seriously thought we should turn around as the road ahead seemed like it was getting more difficult and we really did not know what lay ahead. Road into Long Tien like a snake around the mountains. Breathtaking views! This last section was slow, but we decided to push on in the hope it improved as our research suggested the road was supposed to be good! We did push on and soon we found ourselves on a very new, wide and well graded road wrapping itself around the mountain sides like a red python around its prey. 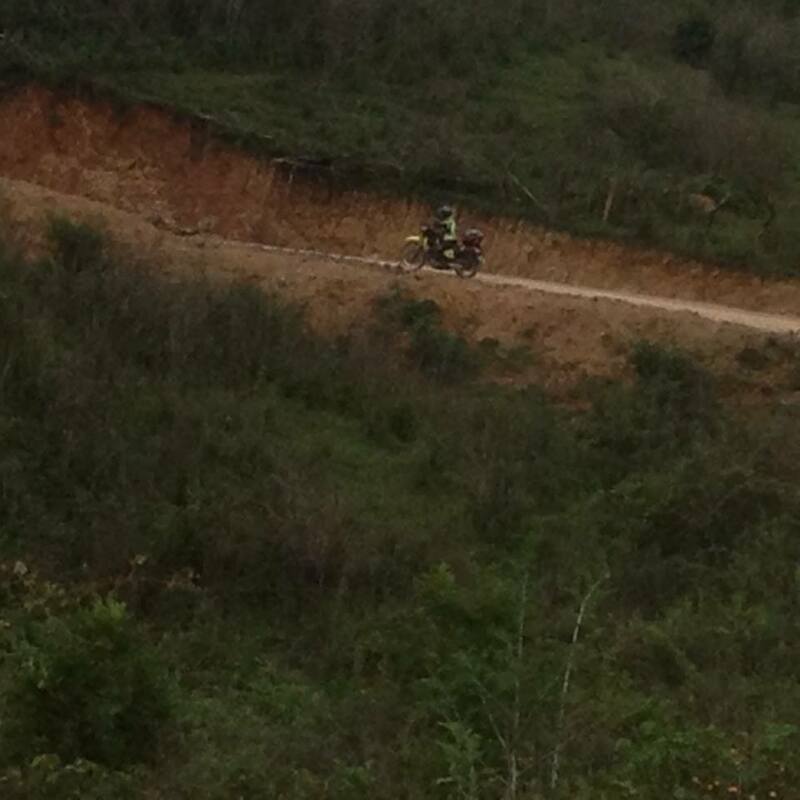 The way was steep, sometimes rocky, sometimes of slippery clay but easily manageable and very rewarding. Reaching the crest of each jungle mountain pass, we would both stop to take in the vistas and gaze in awe at the beauty before us. As we bypassed the highest mountain in Laos Phou Bia at 2810m, this was proving to be one of the most rewarding days yet on our RTW trip. The views were spectacular, we were in remote jungle and the roads were interesting and varied. As we passed a large copper and gold mine, it seemed we had discovered the reason for the newly graded road. But as we learnt later, there is also a large hydro dam in the early stages of construction. 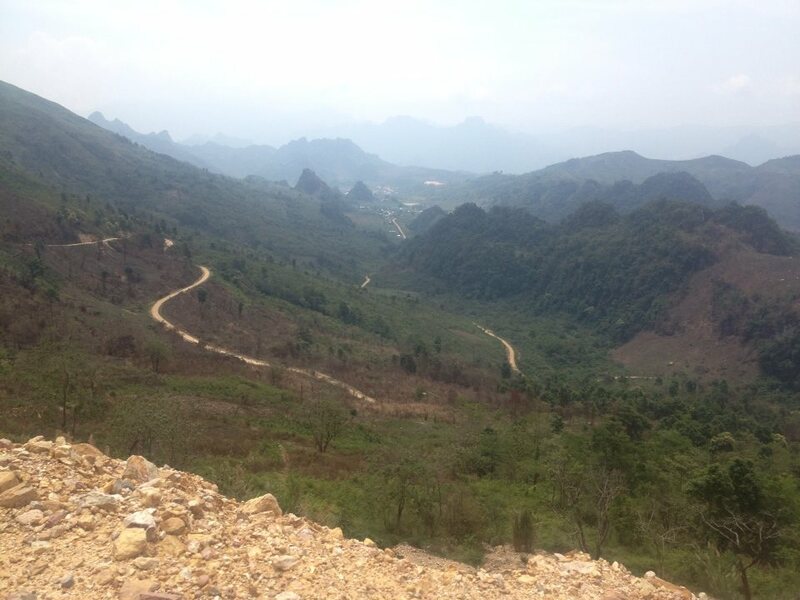 The road was a red scar in the rugged karst landscape. I pondered on how the villagers whose bamboo and grass huts were perched on mountain sides and deep within the valleys could travel in this forbidding country in days gone by. Children running away from us! 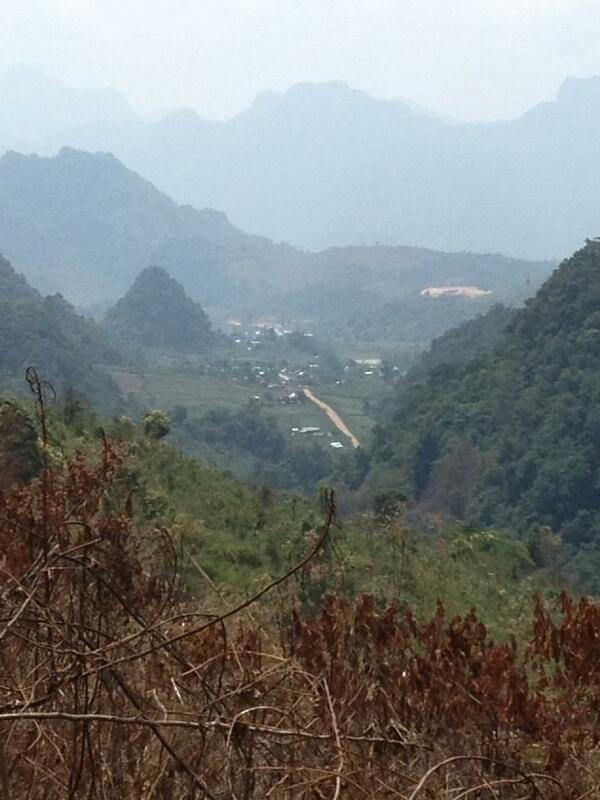 Finally, from a high viewpoint we recognised the village of the infamous Long Tien. It was particularly recognisable because the prominent and very long airstrip nestled lazily along the valley floor, surrounded by distinctive peaked karsts. This was the airstrip built by the CIA and reputed to have been, at one stage, the busiest airstrip in the world. We had been advised to take off our helmets before entering the village so to appear less threatening to the army officials. As we approached with our helmets over our elbows, we saw the expected military check point was just an empty guard house. The airstrip ran alongside us and we were somewhat confused as to how we could be turned away at this point. The military base was on the other side of the airstrip with a clear guarded entrance. Feeling very lucky at this stage, we kept riding ahead looking for the guest house that had been recommended, Mr Saysamones. Shophouses, bamboo huts and a strange eclectic mix of metal walls, fences and other contraptions formed an avenue alongside the airstrip. At the end of the 1260 metres airstrip, huts nestled amongst two storey brick and stone buildings which were abandoned and derelict. Being a Saturday, the day after Labour Day, many people were socialising the Asian way; sharing food and beer on their front verandahs. Stopping at one such place to ask for directions to the guest house, a man emerged with a beer, approached us on our bikes and gave us a sip each, inviting us to stay for food and more beer. Laotian hospitality again! With the promise to return later, we followed their directions to Mr Saysamone’s Guest house and hospitality.At this point we were even more confused by the stories of checkpoints and intimidating police and military. No-one seemed concerned with our presence at all. 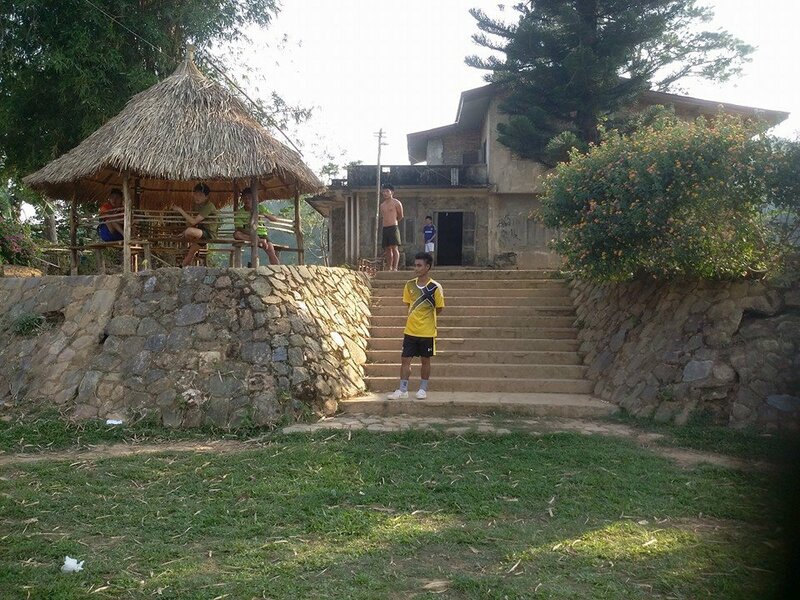 The stares of children and adults, did confirm for us that few westerners visited the village. So after settling into the guesthouse of My Saysamone, we set out to explore the area. Without anyone to advise us of the protocols, we rode around with some trepidation. The history of the village as once being a substantial military base soon became evident. The airstrip took centre place in the village and was obviously designed for large aircrafts. Ruins of stone buildings, fenced secrets, old concrete power poles and other metal debris were scattered within the quiet lives of the villagers in their shops, gardens, farm plots and huts. The village seemed larger and more of an economic centre than any other villages we had passed through on route so far. Perhaps because there is the ghost of a city within the village that people no longer seem to notice as they go about their daily lives. Aside from the military base in its confines, there was also a modern centre of buildings which housed personnel from the dam operations. Up on the hill behind the village was what we had heard was the residence of General Vang Pao, the leader of the Hmong resistance and who was in partnership with the CIA. We found later, that the mainresidence was in fact built by the Hmongs for the Prince of Laos. The General lived in the stone cottage next to it. 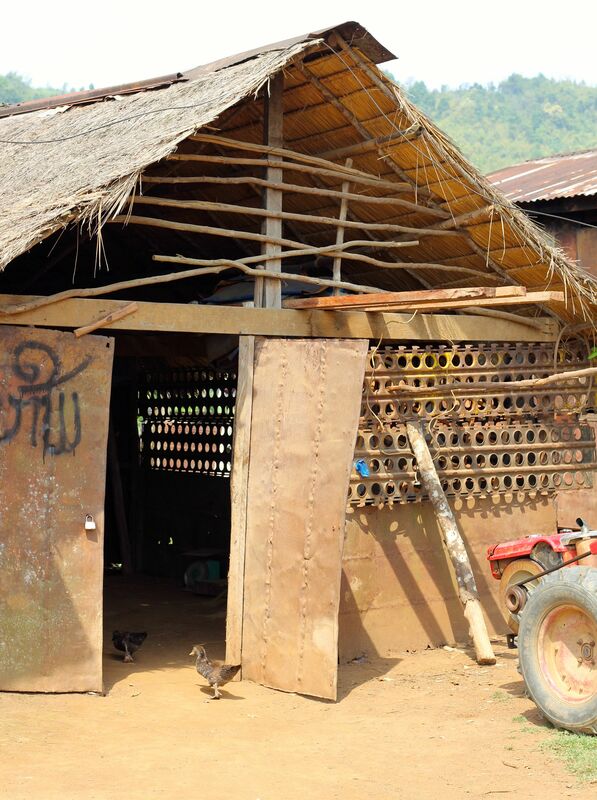 It was from this house that the General was helicoptered out of Long Tien in secret, leaving behind thousands of his people to continue an unsupported battle against the communists. The departure of the General, the CIA and American military caused a flood of Hmong refugees fleeing the area along the route we had just ridden. 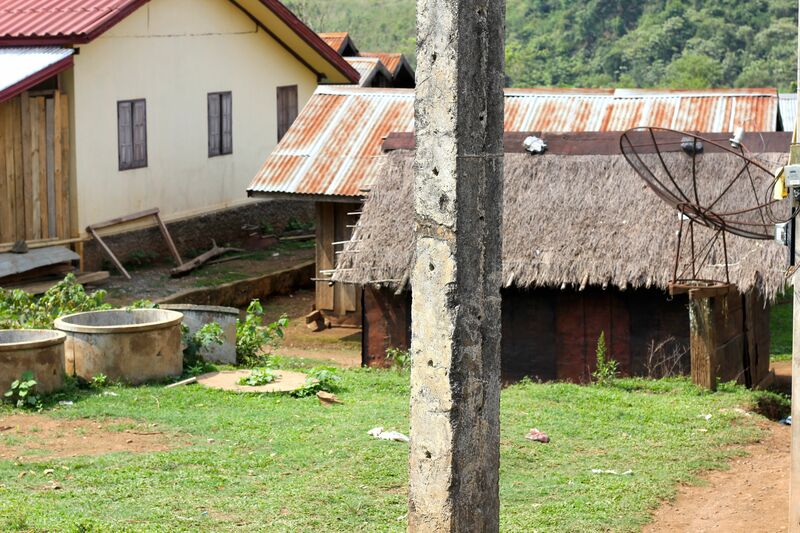 Many were captured and brutally murdered on their way to Vientiane and others escaped to hide in caves. Many of those who escaped to this day refugees cannot return to their country today for fear of retribution from the Laos Government. Riding around the the village, it became clear why there was so much recycled metal to be seen. Tonnes of metal must have been left behind. The villagers had been incredibly resourceful in recycling the war relics, particularly 44 gallon drums. 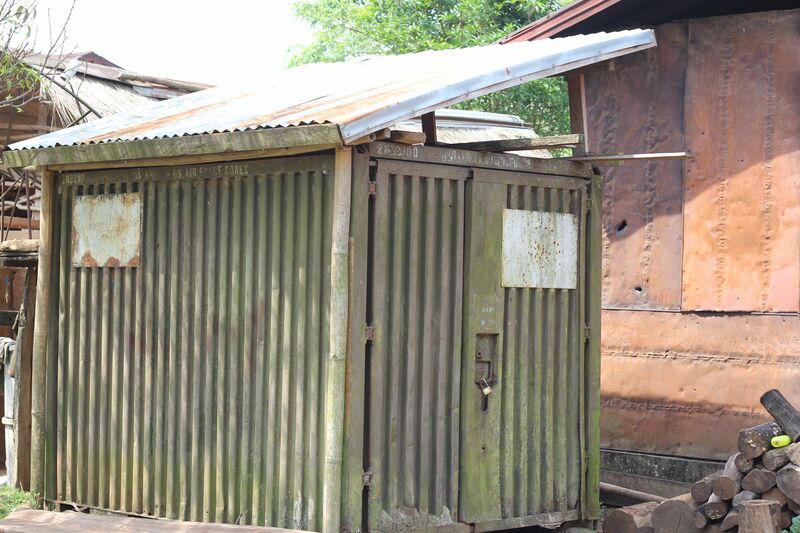 Houses, huts, fences, water troughs and many other contraptions are constructed of flattened out drums. 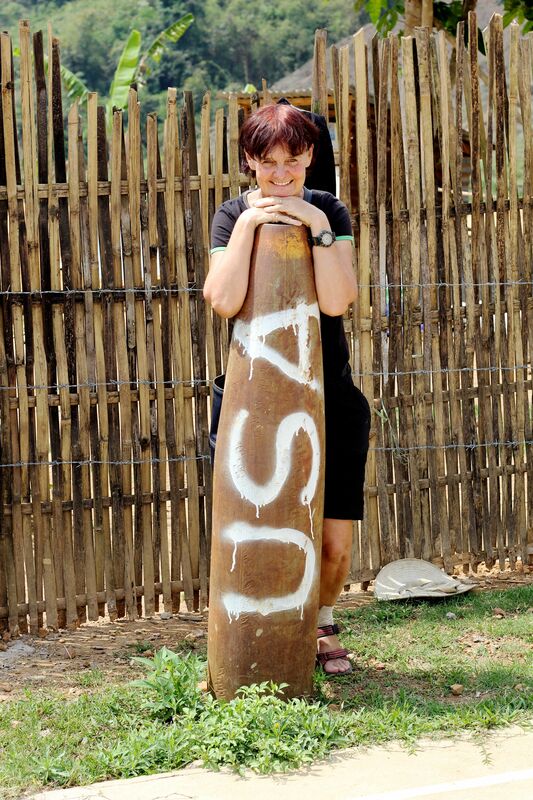 Old missiles and various metal contraptions were also displayed everywhere, much of it still bearing the mark of USA. Passing by the the party in the main street once again, we were obliged to stop in for a beer and some of the communal food and of course the usual baby admiration. It seems the local policeman was the host! Ensuring we stayed sober, we soon left the party to explore further afield. As we grew confident that we weren’t going to be apprehended for taking photos or just for being in the village we decided to head up to the house on the hill. View from the General’s hill. Guest house in foreground- white with red roof. As we neared it, we could see that there were two buildings. One was a more substantial two storey, but run down house and the other, a more humble stone cottage. We were greeted with stares from a group of young men. It seemed to be now used as a housing unit for the military and soon more very fit looking young men appeared as we approached. I smiled and asked if I could take photos, but they said no. So i just pretended to admire the view and took a few photos of the view over the village. Finally, I asked again if I could photograph the house and one lone voice said yes, whilst another said no. I said,”Yes?” and again someone replied, “Yes”. So I took a photo of some stern faces. Upon showing them the pictures, the ice was broken and before I knew it the young men began posing for the camera, as young men do! We soon left the young soldiers with a smile and a thank you and rode back down to the village to venture closer to the army base. 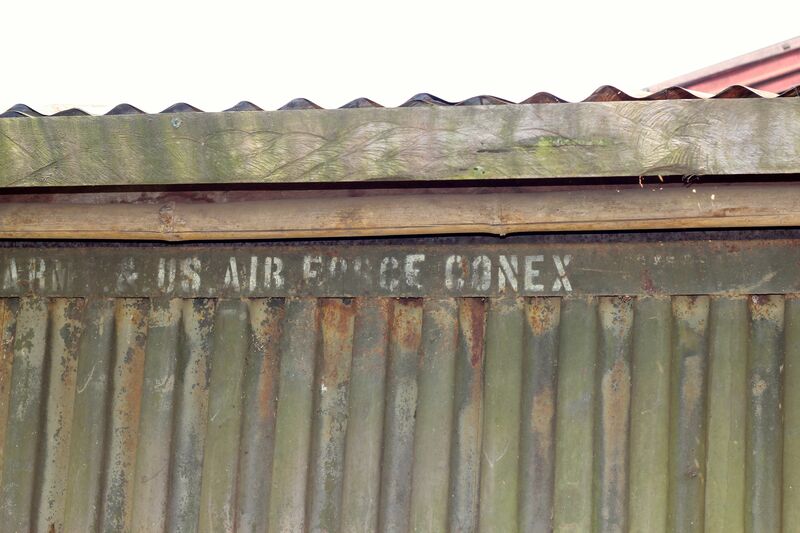 Still no-one seemed concerned with us as we toured the fenced remains of the old American base. An old watch tower looked over old vehicles and disused buildings. 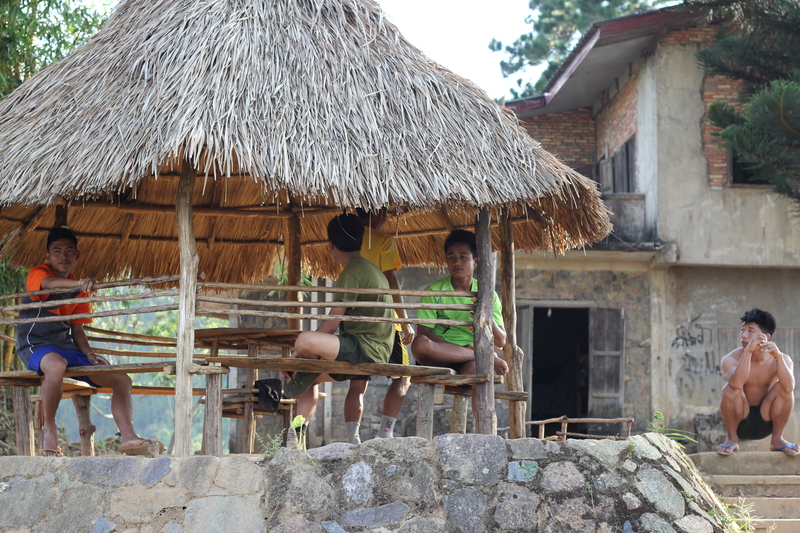 The old stone barracks now housed Laos soldiers so we gave them a wide berth. With such freedom we were relishing the opportunity to go where we wished. That was until soldiers brandishing automatic guns in the tray of a pick up truck pulled up next to us. And that was the only military antagonism we experienced. And of course we had just been drinking with a local policeman. The villagers were extremely friendly and happy to tell us about their village. 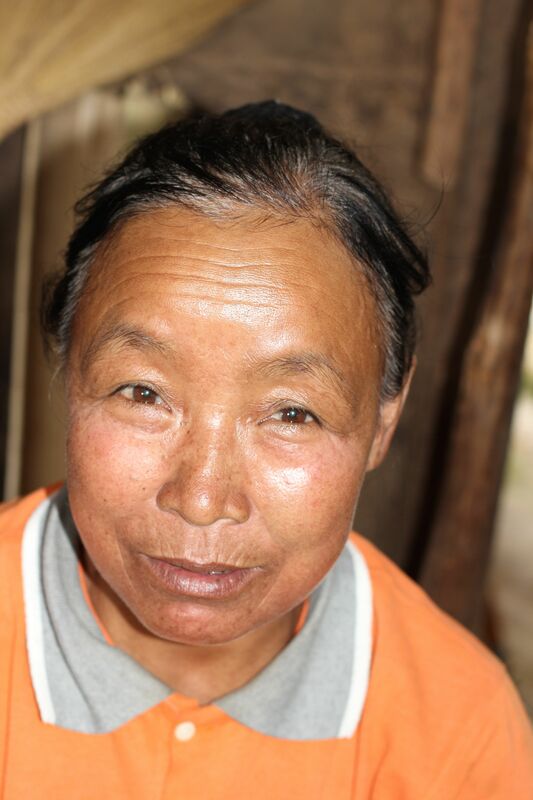 We met an 80 yo Khmu man with three wives, who fought with the Americans. He could not speak English so it was difficult to ask any meaningful questions of him. He seemed proud of his war service. Mr Khamsand worked for the CIA during the secret war. He has three wives. Watchtower in background. One of 3 wives. Mr Saysamone, our gracious host was happy to share information although he was not born until after the Americans had left. He said the village had only just been opened to visitors and that next year it would be free for everyone to visit. I am not sure what that means in real terms. Perhaps the dam construction nearby had meant the Army had to relax regulations or maybe for some reason unbeknown to us, the whole area was no longer sensitive. Truth be known we did not really known just how restricted the area had been since 1960, nor how lucky we were to have been able to gain entry to such a historically significant village in the history of the Indochina war. In our naievety , we had gained entrance to what was once the most secret city on earth and it seems kept it’s secrecy for nearly 50 years. We are privileged to have been able to visit a place with such a secretive history and to begin to be able to lean more of the story of The Secret War. A war which has left behind a terrible legacy of unexploded bombs throughout this beautiful country. 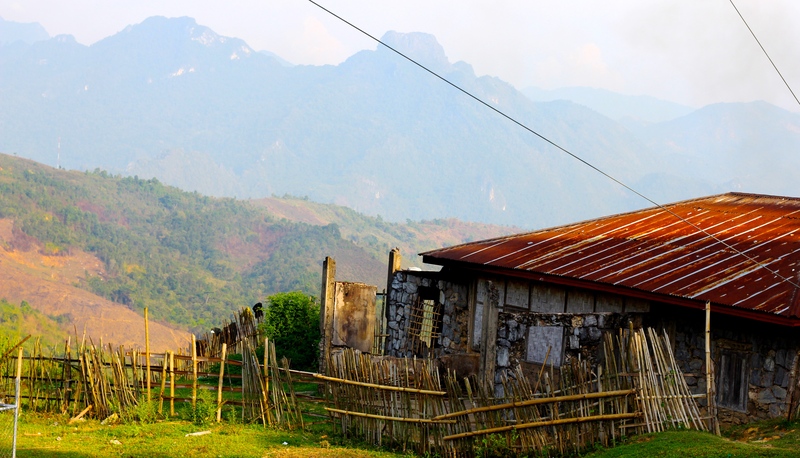 The ride out of Long Tien took us into more spectacular countryside of mountains and deep valleys. We passed through some extremely remote and very poor villages. People stared and children continued to cry at the sight of us, but some welcomed us with the greeting of Saibadee. The road slowly improved as we neared Phonsovan and the famous Plain Of Jars. Our ride to Long Tien was, for two Australians who are lucky to live in a country which has not been ravaged by war, a moving introduction to the Secret War. 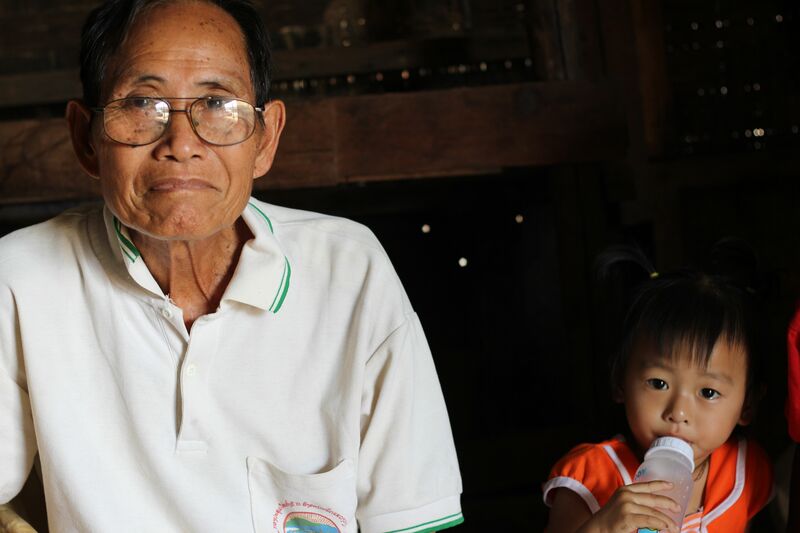 It left us wanting to know more about how Laos became the most bombed country in the world and how these beautiful people manage to live in it. These children did not run away! 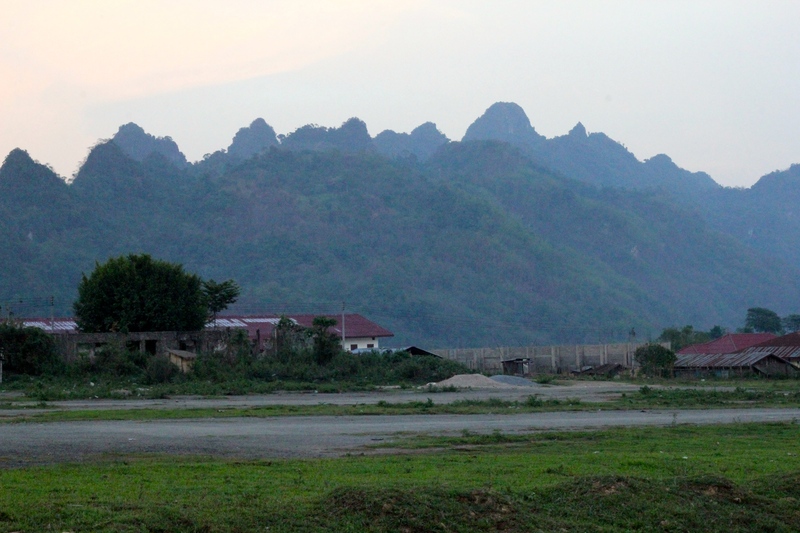 great blog about Longchen, as a base for “Air America”during the viet war. Loved the account of an exciting adventure. Felt like I was there myself. Very intrigued by this place. It motivates me to take up travelling at some stage of my life. Thank you Ahmed. I hope you get to live your travel dream. I’ve been wondering about Lima Tango for many years since I was there several times in 1969. I was in a classified program called MACV SOG. I was on a Special Forces Recon-Team. 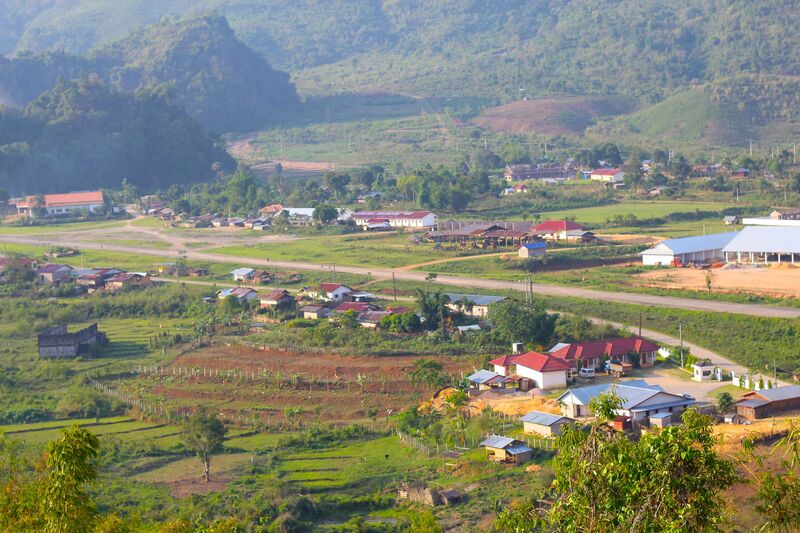 Long Tien was one of our bases and launch sites into Northern Laos. It was very dangerous work and I don’t have alot of fond memories of it. 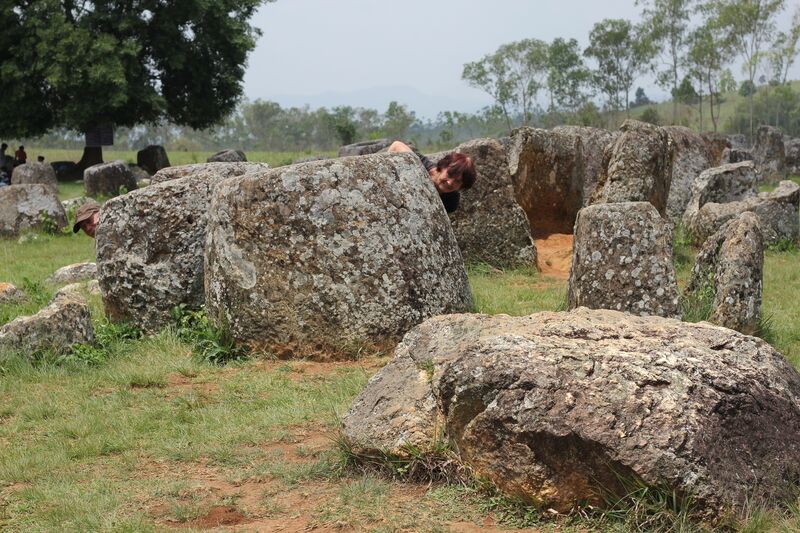 The POJ , Plain of Jars, even then, was fascinating. Incredible history. I’m encouraged by the well-fed appearance of a beautiful people. None deserved what happened there so long ago. It keeps the country in poverty.